Order your Willam Henry Limited Edition Monarch Ponderosa Red Pinecone Knife today from FahrneysPens.com. Fine Pens, Refills & Luxurious Gifts – great prices & fast shipping. The William Henry Monarch ‘Ponderosa' features a beautiful frame in hand-forged 'Twist' mokume gane by Mike Sakmar, inlaid with stabilized Blue Spruce Pinecone. 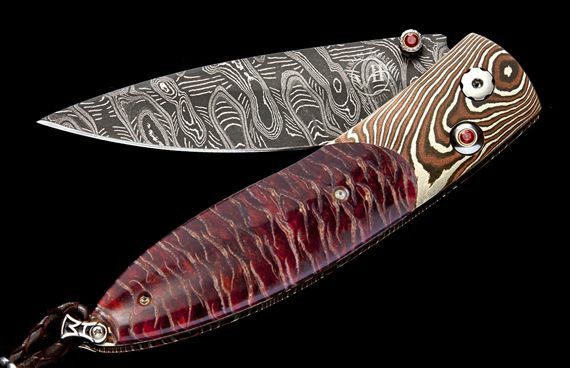 The blade is hand-forged 'Hornets Nest' damascus steel by Mike Norris; the one-hand button lock and thumb stud are set with Blazing Red topaz gemstones. The Monarch is a simple design that is easy on the eye and effortless in the hand; the elegant shape of the handle on this design is also an ideal canvas to showcase our exotic materials. The ‘Ponderosa' is the beautiful balance between elegance, function, modern and exotic materials. All William Henry knives feature a unique serial number which is engraved into the blade to assure the authenticity and lifetime traceability of the product. This knife is shipped in an elegant wood presentation box, including a pocket clip case made from soft, high-grade leather, with an integrated stainless steel pocket clip. Limited to 250 numbered pieces.